I painted a park bench! | It's time to go to MARS and do so as FRIENDS! I painted a park bench! 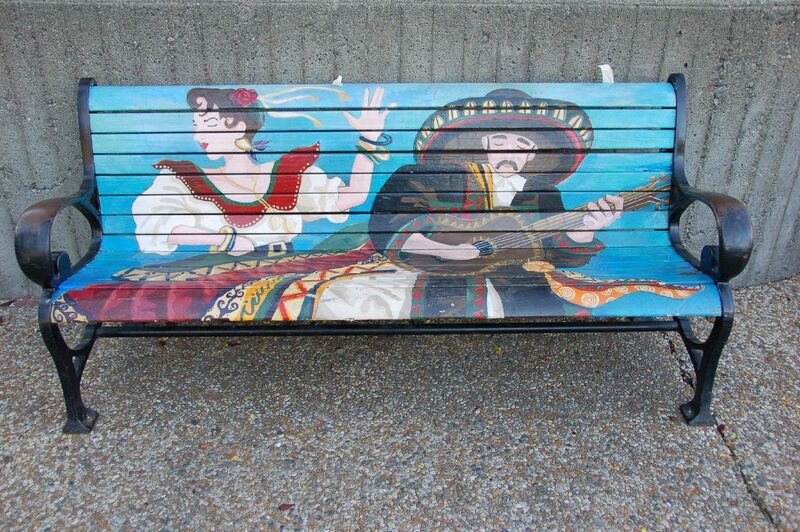 This is a park bench that I designed and painted when I was 15. My first employer was ArtStart, a really awesome public arts program that mentors and trains young artists and pays them to create murals and park benches to beautify Santa Rosa. Working with ArtStart was one of the best experiences I”ve ever had. Everyday I listened to Led Zeppelin in a giant warehouse of my peers and local artists and came home with paint all over my jeans. I hope that I can return to a creative and liberating work atmosphere like that again. My painting abilities have since evolved markedly, but I haven”t picked up a brush in a couple of years and miss the feeling of scrubbing ink and paint off of my forearms. I also hope to one day contribute to/found a similar youth arts program. We need more community art and outlets to creatively empower kids. This entry was posted in Art Atrium by melissa. Bookmark the permalink. I love how vibrant it is! You have a lot of talent 🙂 It gives such a happy mood. I remember seeing this but I had no idea that you painted it! How cool is that?